This article originally appeared on 360 Labs’ website. Follow their blog for more insight from Matt and the 360 Labs team. Not all VR video experiences are created alike. When we ask our clients if they need stereoscopicVideo shot with two parallel cameras (or in the case of 360° video, multiple pairs of parallel cameras) Commonly referr... More or monoscopic 360 video, we’re often met with blank stares or silence on the other end of the line. This isn’t a surprise given the rapidly changing technology and the new advancements we read about almost every week. It’s hard to keep up! When YouTube launched 360 video support in early 2015, they brought this new immersive video medium to the masses for the first time. Since then, new formats and flavors of 360 video have been implemented such as 3D stereoscopicVideo shot with two parallel cameras (or in the case of 360° video, multiple pairs of parallel cameras) Commonly referr... More 360 and VR180. Facebook and other platforms have also jumped on board to support these new formats as well. We know it can be difficult to wrap your head around how these formats work and decide which one might be the best for your project, especially if you haven’t seen a concise comparison in a headset. To help inform these decisions, we’ve created the following simple guide. Mono 360 video was the first and is the most prominently used format for immersive video today. A mono 360 video is usually a 2:1 aspect ratioThe display ratio of resolution pixels along the x axis to the y axis (i.e. HD video of 1920 x 1080 pixels has a 16:9 as... More equirectangularStretching a spherical image into a flat, rectangular format. (i.e. the way a world map represents the spherical Earth).... More video container, common resolutions include 3840×1920, 4096×2048, 5760×2880, and 7680×3840. Think of equirectangularStretching a spherical image into a flat, rectangular format. (i.e. the way a world map represents the spherical Earth).... More like a world map from a globe, unwrapped and flattened. Although many 360 videos are a minimum of 4K, content can often still look very blurry. I’ll explain why. When viewing 360 video content, the viewer is only seeing a small slice of the 360 footage at a given time within their field of viewThe angle of space viewable from a given lens position.. This means that a 3840×1920 360 video is actually only displaying about 1280×720 in the viewing portal at a given time. This is why VR video content sometimes looks like television from the 1990s. For this reason, every pixel counts! 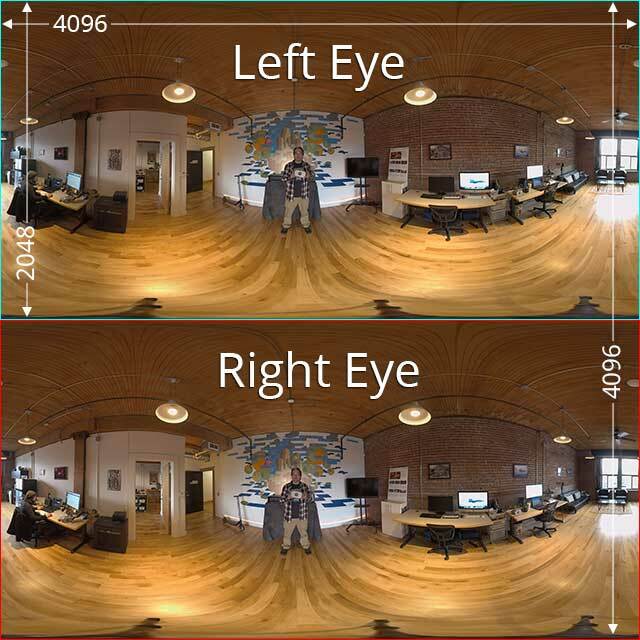 This animated example shows the perspective shift per each eye, which creates the sense of depth in a 3D stereoscopicVideo shot with two parallel cameras (or in the case of 360° video, multiple pairs of parallel cameras) Commonly referr... More video. Because both channels are stored in the same video container, this means that essentially your resolutionThe number of pixels in an image, typically presented as a ratio of the total pixels on x axis to the total pixels on th... More is cut in half to the end viewer. To compensate for this, stereo 360 videos should be delivered at double the resolutionThe number of pixels in an image, typically presented as a ratio of the total pixels on x axis to the total pixels on th... More of mono, which can be challenging for most streaming platforms and hardware. Common stereo resolutions may include 3840×3840, 5120×5120 and even 7680×7680. For lower end hardware, it’s typically delivered in 3840×2160 resolutionThe number of pixels in an image, typically presented as a ratio of the total pixels on x axis to the total pixels on th... More and both “stretched” stereo channels are crammed into this container, but at this resolutionThe number of pixels in an image, typically presented as a ratio of the total pixels on x axis to the total pixels on th... More we lose a tremendous amount of detail. In this example frame, we see 2 independent stacked videos per each eye in the video container, for a 3D 360 video at 4096×4096 resolutionThe number of pixels in an image, typically presented as a ratio of the total pixels on x axis to the total pixels on th... More. But how does anyone play a 7680×7680 video file on any device? 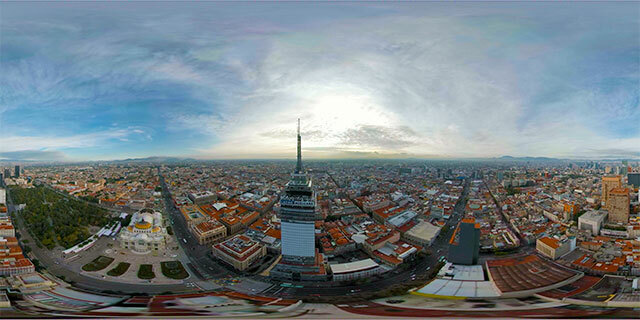 Thankfully, companies like Pixvana and Visbit have developed what we call viewport biased 360 players. These platforms are specifically designed to display only the pixels in your field of viewThe angle of space viewable from a given lens position. at the highest resolutionThe number of pixels in an image, typically presented as a ratio of the total pixels on x axis to the total pixels on th... More, while conserving bandwidth and processing power by showing the pixels you aren’t seeing in lower resolutionThe number of pixels in an image, typically presented as a ratio of the total pixels on x axis to the total pixels on th... More. When you move your head, the resolutionThe number of pixels in an image, typically presented as a ratio of the total pixels on x axis to the total pixels on th... More will seamlessly adapt. Pretty cool, huh? Unfortunately, this type of technology is not implemented in quite the same way on mainstream platforms like YouTube and Facebook. Very recently, popular video platforms like YouTube and Facebook have begun to support VR video content in 180 degrees. VR180 is a video file containing 2 channels of video for the left and right eye, but for only the front facing 180 degree field of viewThe angle of space viewable from a given lens position..
VR180 can be beneficial considering the bandwidth and file size concerns we mentioned about stereoscopicVideo shot with two parallel cameras (or in the case of 360° video, multiple pairs of parallel cameras) Commonly referr... More 360. Because you aren’t wasting bandwidth or processing power to show the pixels behind the viewer, you can cram more detail and pixels into a VR180 project. The Vuze XRAll of immersive media encompassing VR, AR, MR and beyond. 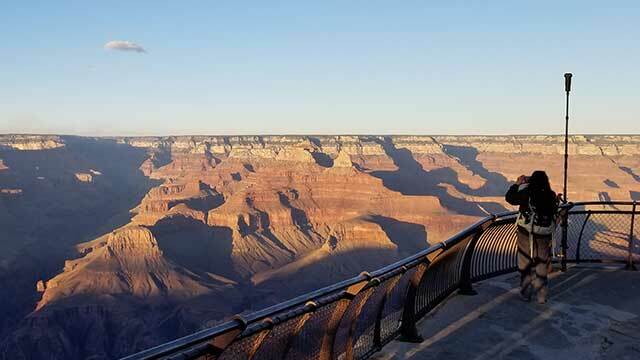 camera can transform from 360 to 180. 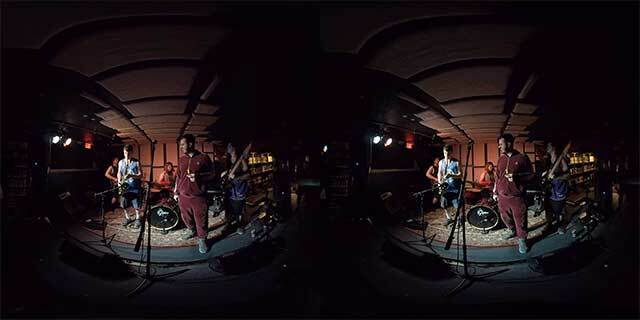 StereoscopicVideo shot with two parallel cameras (or in the case of 360° video, multiple pairs of parallel cameras) Commonly referr... More 360 content requires careful consideration and is best implemented for projects where you have 100% control over your set and actors. Stereo really shines where the depth can actually be appreciated. Objects or actors who are too far away won’t appear to be 3D at all. You also need to be sure to position your talent between stereo pairs of lenses, which gives you the optimal effect of depth. Stereo deadAn environment with little or no reflections or reverberations of the sound. zones, or areas where the overlap between perspectives is not ideal, can cause eye strain and discomfort as viewers try to focus on the content. Moving the camera can also be very unforgiving in stereo 3D, any stitching anomalies as a result of this can cause motion sickness and eye strain. If budget is a concern, it’s also important to keep in mind that stereoscopicVideo shot with two parallel cameras (or in the case of 360° video, multiple pairs of parallel cameras) Commonly referr... More 360 production can be more costly. 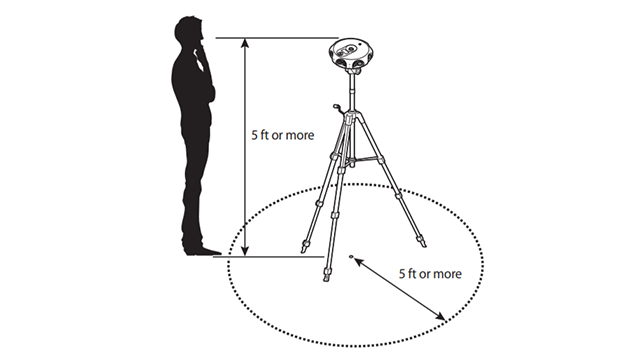 The cameras are more expensive and have higher day rates, the production crew may need to spend more time on location to ensure that 3D shots turn out perfect, and live monitoring solutions may be needed to make sure that actors hit their marksA position on set (defined during blocking) where an actor is supposed to be at precise moments during a scene. On set, ... More. In post production, since you are dealing with 2 video channels, you are essentially doubling the work. Logos, titles, and text also need to be properly setupA camera position for a given scene. You might shoot more than one shot from a single set-up (wide shot and close-up). for 3D display, which takes more time as well. 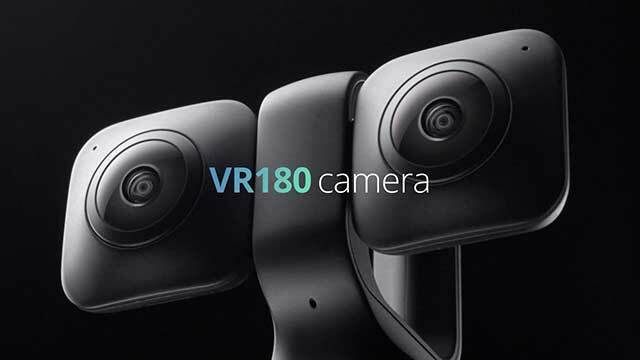 VR180 simplifies the stereoscopicVideo shot with two parallel cameras (or in the case of 360° video, multiple pairs of parallel cameras) Commonly referr... More workflow by a great deal, but at the cost of not having a fully immersive 360 scene. Since there’s no actual “stitching” involved in post, but rather just positioning and calibration, this can save a massive amount of time and budget. Shooting in mono can be a better choice for chaotic environments such as live events, journalism, reality, documentary, extreme sports and other settings where you don’t know exactly where the action will be. Landscapes, nature scenes and wide open shots may also be better in mono because the stereo has no effect beyond around 20 feet. And since you aren’t splitting your pixels in half to display 2 channels in the same container, these scenes will also look sharper and higher resolutionThe number of pixels in an image, typically presented as a ratio of the total pixels on x axis to the total pixels on th... More in mono. Moving the camera can be more forgiving than with stereo, since it can be easy to produce a seamless stitch. It’s also hard to decipher 3D depth in moving shots anyway, so in some cases, stereo can be a waste with action packed content. You might ask, why not just shoot in stereo and turn that into mono later? This makes sense because you always have the option of delivering in stereo if it works out, but there’s also a tradeoff to consider. StereoscopicVideo shot with two parallel cameras (or in the case of 360° video, multiple pairs of parallel cameras) Commonly referr... More 360 video cameras are generally larger and have more parallaxThe optical effect where an object’s position appears to differ when viewed from different positions, i.e. the left ey... More distance between lenses. This actually makes it more difficult to get a good stitch in monoscopic. For this reason, if a project is intended to be distributed in mono, it’s generally best to shoot it that way to begin with. You may have heard people refer to VR experience as “3DoF” or “6DoFSlang for Six Degrees of Freedom..” The “DoF” stands for degrees of freedom. A 3DoF experience allows the user to look around within a 360 environment, whereas a 6DoFSlang for Six Degrees of Freedom. experience allows them to actually move around in the physical space. With six degrees of freedomThe ability to move left-right, up-down, and forward-backward (in addition to being able to rotate around the x, y, and ... More, you can takeIndividual instance of a shot; a take = each time the camera is started and stopped. a step towards a tree, or even kneel down to look at the details of a flower. The majority of 360 video experiences today are only 3DoF, and most 6DoFSlang for Six Degrees of Freedom. experiences are built in CG (computer graphics) engines for games or animated content. Game engine experiences are inherently easier to produce in 6DoFSlang for Six Degrees of Freedom., given the fact that they are 3D generated worlds. However, there are experiments in 6DoFSlang for Six Degrees of Freedom. 360 photography and video today. The idea of having a truly photo-realistic 6DoFSlang for Six Degrees of Freedom. experience in VR is pretty phenomenal, when we can perfect this, it’s like having the holodeck(from Star Trek) A chamber where a person is immersed in a holographic simulation of a physical environment indistinguis... More from Star Trek. But don’t get too excited, it’s still a long way away from mainstream. Photo-realistic 6DoF experiences are very hardware intensive and the capture technology today is just not that practical for most projects. They’re also very limited in just how far you can move, without a massive amount of pixel data from every angle, objects tend to break up and look warped. The majority of these types of experiences today only exist as tech demos. One great example you can check out is Google’s “welcome to lightfields,” you can read more about it in their blog. You can also read more about the above example of 6DoF video by reading about Facebook’s recent partership with RED on RED Manifold.